These lists of great bars seem to come around often, but looking through this one… this list actually looks pretty darn solid. They’ve chosen to highlight bars that fall under one or more of 12 categories, including new bars, neighborhood bars, whiskey bars, tequila bars, gin bars, … and one of the categories is Tiki. It is pretty thrilling to see Tiki respected as an important category. I never tire of marveling at how things have changed in the last 10 years. It wasn’t that long ago that Google Alerts on the word “tiki” brought mostly reports on football player Tiki Barber or a guy’s hairless cat named Tiki. It’s especially gratifying to see that the tiki bars on this list really are tiki bars; there’s been more than a little grumbling of late when lists of “best tiki bars” are full of places that don’t qualify as tiki bars in most tiki lovers’ eyes. It’s an especially good feeling to read the note on the entry for the Mai-Kai explaining why it’s on the list: the reason given by Liquor.com is the Mai-Kai topping the list of Critiki’s Ten Best Tiki Bars in the World for 2015. 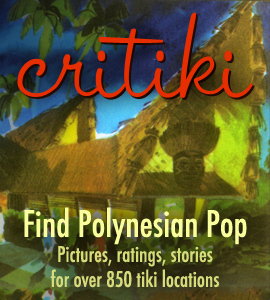 I built Critiki to help people learn about great tiki places, and to help drive support of these great tiki places. If this is a sign of all of that effort bearing fruit, well, dang. I’m a happy tikiphile. Go poke around the whole Drink Here Now list at Liquor.com, it’s full of fantastic spots that are worth your time.